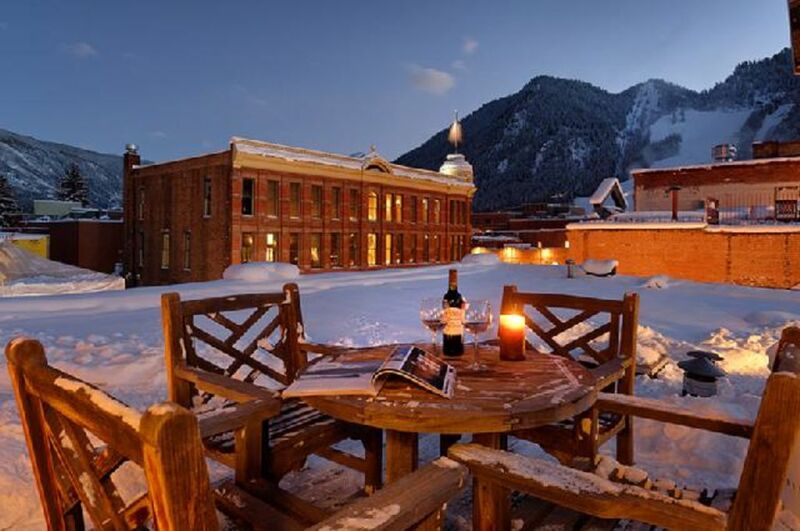 Our penthouse is located in the heart of Aspen in the historic Brand Building, which is rich in Aspen history, very private and an exclusive address. The Brand Building was built in 1891 and after a meticulous restoration it was featured in Architectural Digest. Just 2 blocks from Gondola. The Silver Echo (each unit is named after a local mine) will provide discerning guests with a private retreat incorporating all the finest of amenities. It's perfect for that special vacation or gathering. Throughout the condo the designer furnishings are accented by original artwork from the owners private collection. Numerous windows throughout the entire main living area affords fabulous Ajax (Aspen mountain) views. Watch skiers descend or hikers ascend Ajax from the gourmet kitchen as you enjoy your morning coffee while seated in the dining room or the living room. You have the best seat in the house! The upstairs living room /loft features a gas fireplace and leads out onto your huge private rooftop deck. Your deck offers plenty of seating for a meal or a front row seat for Aspen fireworks. Perhaps you'll want to BBQ on your professional BBQ grill at your disposal. While you're here, enjoy the spectacular 360 degree panoramic views of the mountains and town. The Silver Echo additionally offers two private suites with private baths. One master suite offers a king size bed, the other a queen. Each bedroom is uniquely appointed with vintage accessories. The large recently remodeled bathrooms, include separate sinks, over sized tubs and separate tile showers. To make your visit as comfortable as possible top of the line bedding including down comforters, Crabtree and Evelyn bath products and luxurious linens/down pillows will ensure a good nights sleep even after a hard day on the slopes. The kitchen, has built-ins, a pantry, plenty of barware and cooking utensils. This is a gourmet chef's dream : Subzero refrigerator, Wolf range, granite slab counters and all the utensils you will need to create that special meal. The winter offers world class skiing for all ability levels, free shuttles to Snowmass, Aspen Highlands and Buttermilk ski areas, world renowned shopping, gourmet dining, galleries, and a town rich in culture and history, all easily accessible due to your ideal location. Summers are equally as enjoyable and beautiful when the activities include fly-fishing, river rafting, hiking, mountain biking, canoeing, many special festivals and more. Plan to come for the Aspen Food and Wine Festival, Aspen Music Festival, Comedy Festival or other cultural events. If you come to ski we are just 2 blocks from the Silver Queen Gondola which services Aspen mountain. We are a block away from the free shuttle that takes you to Snowmass, Aspen Highlands, or Buttermilk ski areas. Down the stairs and out the front door you are surrounded by the finest restaurants, art galleries, coffee bars, bakeries, designer clothiers, the famous Caribou Club, movie theaters and lovely little shops filled with serendipity. Previous guests have included world and financial leaders, celebrities from TV, film and sports. This is the ideal place to stay if you want a private, restful luxurious vacation yet still be in the hub of things. Amenities: Wifi, private roof top deck with BBQ and seating accessed from main living area, top of the line stainless kitchen appliances, washer/dryer, safe, cable TV, I-pod docking available at stereo and two phone lines, all in a secure building. One bedroom/one bathroom condo also available in same building. See VBRO listing #197615.
toilet, tub, shower, Two sinks. Separate tub and shower. Unparalled views of Ajax and Aspen from the unit as well as the private rooftop deck. Swamp cooler and separate air-conditioner unit. Top of the line linens and towels. Luxurious bathrobes provided. Top of the line kitchen with stainless appliances. Three flat screens. One in each bedroom and one in the living area. Huge private deck with views of Ajax front and center! Rare amenity. Unparalleled views from the unit as well as your private rooftop deck which is accessed from the main living area. Truly one of a kind! In room safe. The view out our windows is indeed special and the private rooftop deck is one of only a handful in Aspen. Happy you had a great time! It was exactly as advetised. Beautifully decorated, immaculate, comfy beds, great linens, etc. The view was fantastic and the location perfect. We would definitely stay here again. Spent a long Labor Day weekend at Carol's penthouse in Aspen. Attended the JAS Festival. Aspen has wonderful weather. This penthouse is beautifully decorated and has everything it's guests need. The location is magnificent and everything is within walkable distance. And Carol is very attentive and an absolute pleasure to do business with. I absolutely will stay here again on my next travels to Aspen. My family stayed here through the New Years Eve holiday weekend, during which we enjoyed an unbeatable view of Aspen Mountain's fireworks display. We loved the convenience of this place -- it's just a short walk from the base, steps away from shopping and restaurants. The rooftop deck was the perfect spot for our 2-year-old to shovel snow and build snowmen. A couple of tips to manage some small negatives: If you drive or have a car, the long-term parking is a little far away. Also, if you have a small child, the place has a lot of stairs and some antiques that are not kid-friendly (which the owner kindly warned us about). We simply moved a couple things out of our son's reach and it worked out fine. We will definitely visit this place again. I'm happy you had a great stay and were able to enjoy the fireworks off your private rooftop deck! The penthouse is on the second floor of The Brand Building. It's a two story penthouse with about 10 more stairs to get to the loft and rooftop deck. I mention it's not child friendly on VRBO because of the stairs and rooftop deck. Adults love the floor plan because it gives everyone their space! Aspen parking is difficult and the city garage is a two block walk. I always recommend you unload/load in front of the building and the driver can take the car to the garage. There's no need for a car while staying in the penthouse which is located in the center of town. Everything you need is within a 2-3 block radius! Fabulous stay above Gucci dont have to walk far to shop..
My husband and I decided to go to Aspen for our 10 year anniversary and found this lovely Penthouse above all the shopping in town. It was easy to walk to all the restaurants and shopping. The home was clean and very well cared for. Right in the heart of Aspen without feeling all closed in. You wont go wrong on renting this great home on vrbo. The owner was so sweet as to tell us of great shopping and restaurants. She was very helpful.. I with some friends decided to make a long weekend in Aspen and choose this wonderful residence. Everything from the booking of the residence to the location was perfect. It is minutes from all the restaurants and is with out a doubt a great find in the heart of Aspen. We grilled outside and just took in the magnificent views of Aspen Mtn. and watched the sun rise and set from the great deck. Please consider this residence for your stay. Departure cleaning required in excess of standard departure clean shall be billed at $40 per hour. Early check in or late check outs may be available for an additional fee. Food and Wine 2019 maximum number of guests in penthouse 3. US credit cards accepted. International credit cards will incur a 2% fee.